FOX’s MASTERCHEF returns for another delectable season with a new roster of talented culinary artists on Wednesday, May 30th. Ahead of the season nine premiere, award-winning chef, TV personality, and cookbook author Aarón Sánchez shared his insight into this exciting new season with Lawndale Bilingual News. 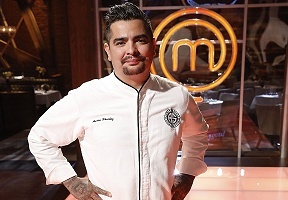 Lawndale Bilingual News: MasterChef, which is set to premiere on May 30th, has become a juggernaut of a show. Why do you think so many tune in season after season? Aarón Sánchez: You get to really go on a journey with the contestants, and you get to know them, so I think there is a bigger level of commitment from the audience as they are invested in their favorites on the show. What moment in the season are you excited for viewers to see? I love the field challenges as you get to see how the contestants do in real world circumstances. Knowing that judges will also serve as mentors this season, what can you reveal that will excite viewers? I’m not allowed to say too much, but I think it will be a very different season because of this and you get to see our dynamics and how we work as teachers and you get to see how the contestants really react to our advice and guidance. For young Latinos aspiring to enter the culinary industry, what advice would you give to them on how to create their mark in a competitive environment? Well work ethic is monumental, and knowing who you are. Those two things combined with curiosity and always striving to know more will allow Latinas and aspiring chefs in general to get where they want to be. I love working on this show because of all my amazing colleagues and it’s really an honor to teach these home cooks and watch them grow and find their voices. © 6923 Chicago Hispanic Newspaper, Lawndale News, Hispanic Bilingual Newspapers, Su Noticiero Bilingue. All rights reserved. XHTML / CSS Valid.